SNK's classic fighting series arrives on the Xbox in fine fashion with Samurai Shodown V, a superb arcade translation for the console. The title's back-to-basics design should please fans of the earlier installments, and the addition of Xbox Live support adds to the multiplayer mayhem. 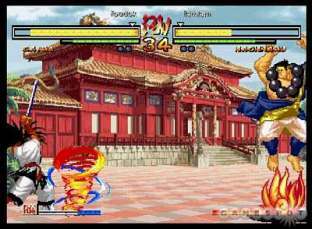 A typically deep lineup of fighters and an extensive moves list adds to the challenging gameplay, which features tight controls and solid opponent AI. The game is somewhat lacking visually, though it fits in nicely with the earlier titles. SSV isn't the most innovative game of its kind, but its' a solid title that should please fans of the series. While the original hardware is definitely showing it's age after 15 years of solid performance, there's still life in the Neo-Geo and its developers at SNK. While the system has always appealed to a niche audience, a larger group of gamers has grown to love many of their franchises thanks to their appearance on cheaper consoles. While there are some compromises, such as load time, the home versions of these games have generally been faithful to the originals. Now, SNK has struck once again, and Xbox owners can now enjoy a piece of arcade glory with the release of Samurai Shodown V on the console. Returning the series to its MVS core in many respects, this edition is an excellent installment in the long-running action franchise. In contrast to other fighters on the market, which get players involved with flashy moves and massive combos, the gameplay of SSV has always been a bit more subtle and nuanced, though the game still features the infamous Rage moves which make your attacks more powerful for a short time. As you fight your opponent, your gauge increases and when it's full, you can unleash powerful combos which cause a significant amount of damage. Like all great fighting games, SSV doesn't cater to button mashers, and instead requires players to build up their skills by mastering several techniques including blocking and more. Unlike the cut and paste characters in other fighting games, Samurai Shodown's cast actually brings a unique fighting style to the battle, meaning each one has a distinct flavor that makes the gameplay more varied than most fighting titles. Since the characters are armed with swords, its no surprise that each one has their own unique set of slash attacks as well, with strong and standard attacks to slice through their opponents. Knowing when to attack and when to keep your swords drawn is a key element in the game, and mastering the timing of the game is one of the key strategies to real success. Samurai Shodown's moves lists are quite extensive and this deep fighting system remains as tightly wound and expertly balanced as ever, though the slightly streamlined approach used in this installment is a tad less intimidating than some of the previous games. One of the more interesting elements this time around is the sword gauge, which you can use to time your attacks, making the gameplay more strategy than you'd expect from a typical fighter. Performing the special attacks takes practice, not in just merely the button combinations, but also mastering when they'll be most effective. The pace is a tad slower than titles like Fatal Fury and King of Fighters, but this more cerebral approach makes Samurai Showdown V more appealing to fighting game veterans. However, this isn't a dry thinker's game, and it remains quite violent, and there's plenty of blood and guts to see onscreen to keep your interest levels high. Samurai Shodown features a huge cast of 26 different characters, 11 of which are new this time. They've been equipped with dozens of special attacks this time around, giving you plenty of options during the battle. You'll find all your old-time favorites here as well, just as powerful and versatile as they've always been, though some have undergone some slight revisions. From an aesthetic standpoint, the game's visuals look decent, though the aging sprites tend to look a little blocky these days. Its lush backgrounds remain impressive and the game's sedated color scheme makes it feel more like a classic anime novel than a cartoon and this grit is one of the key reasons why the series has endured for so long. Some of the game's new characters have been designed by an actual anime artist named Nobuhiru Wazuki. These additons show a great deal of personality and style throughout, while fitting into the parameters of the existing series faithfully. The game's overall look and feel are faithful to the arcade edition, but Samurai Shodown V isn't going 3D with any fancy effects, this is a traditional side-scrolling 2D fighter in the classic SNK mold. Its Xbox translation is fairly excellent and while there is some minor load time between rounds, it's not enough to ruin the gameplay's momentum and flow. In addition to the standard versus and practice modes, the game offers a twist in the form of Xbox Live support. This allows you to compete in a variety of different modes including one-on-one against a single opponent, or against a series of foes in a grand tournament online. This is a pretty cool feature that adds a lot of replay value, and enhances the already solid single player experience. Playing online doesn't mean a loss of speed or accuracy either, since the game suffers from little in the way of lag or dropped games. While there are much fancier and more technically advanced titles on the market, this game succeeds because its solid gameplay and traditional approach still appeals after all these years. Sure, some of the animations seem a little choppy and pixellated these days, but the classic fighting mechanics that have stood the test of time are very much evident, making for a challenging, engaging fighter that offers plenty of depth and style. The additional modes are just icing on the cake and make this an even better value for the money. Samurai Shodown V is a classic gaming icon and this faithful Xbox conversion offers a solid gaming experience that fans of the original SNK titles won't want to miss.